I love Chinese food. It could eat it every day of the week! Since today marks the beginning of Chinese New Year, I thought it would be a perfect time to share this extremely quick and easy veggie stir fry with you. It’s very versatile – throw in whatever veg you have to hand. Courgettes, peppers, mushrooms, baby corn, Pak Choi, spinach are all perfect here – but treat this recipe as a mere blueprint. If you wanted, you could easily add some meat or fish – chicken, beef or prawns would be really good here. 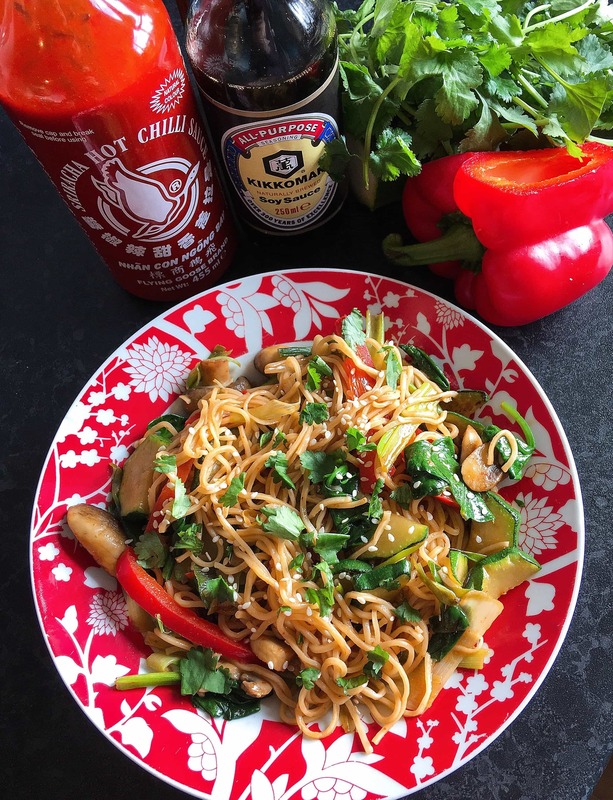 Make your own Chinese style noodles - use whatever veg you have in the fridge for a quick and easy dinner that's so much quicker than ordering a takeaway! You could easily add some chicken, beef strips or prawns. Make the recipe your own! Cook the noodles according to the packet instructions and drain. In a small bowl, stir together the Sriracha, soy sauce and sesame oil. Heat the oil in a wok over high heat. Add the spring onions and vegetables and cook for a few minutes, stirring very frequently. Once the veg has been stir fried for a few minutes. Pour in the sauce, turn down the heat and let it bubble for a minute before throwing in the pak Choi or spinach. Add more soy sauce if necessary. Transfer to a plate and sprinkle with sesame seeds and fresh coriander, if it floats your boat. Add more Sriracha to taste. This is a very versatile recipe – throw in whatever veg you have to hand. Courgettes, peppers, mushrooms, baby corn, Pak Choi, spinach are all perfect here – make this recipe your own. If you wanted, you could easily add some meat or fish – chicken, beef or prawns would be really good. Obviously if you're using chicken or beef, cook them thoroughly first before adding the veg. If you're using fresh prawns, they can be added in the last few minutes of cooking time.